Let’s face it; the vast majority of us have become more and more dependent on our cell phones. It’s simply a sign of the times. That dependence naturally comes in part thanks to the technology that has been packed into these devices and what they can do for us on a daily basis. Look no further than the boom we have seen in golf apps and programs that have become more and more complex, from GPS to scoring and even full swing analysis. However, such apps and programs, particularly if used on the course, do come at the cost of battery drain. An obvious option to help with the frustrating battery drain is through a battery extender. Although such products were once clunky accessories that were a pain to lug around and use, the times have definitely changed. 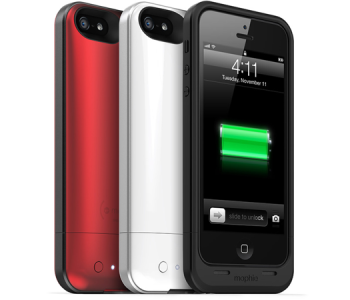 For example, look no further than Mophie and their “Juice Pack Air” for the iPhone 5. The ideal case for the everyday 9-5er and for those whose day doesn’t always end when they leave the office. Lighter and thinner than previous generations, but packed with more power to make sure your phone can keep up with your busy lifestyle. Up to 100% extra battery with the flip of a switch. 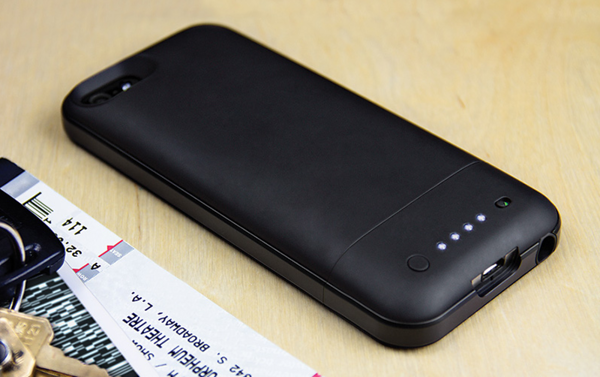 Turn on the case when your battery runs low to stay fully charged through the late nights. Reimagined for the iPhone 5. The refined outer band and smooth finish makes for a comfortable all-day hold while defending from everyday wear and tear. Integrated, pass-through buttons and proprietary mute switch seamlessly blend the design of the case with your iPhone. Recharge both devices together with the included micro-USB cable to make sure you always head out with two fully charged batteries. Whatever the day brings, Do More. I’m an avid iPhone user and I also review a lot of apps and Bluetooth devices that take a major toll on my battery life while putting in work at the course. This one has been a very pleasant addition for me in that regard. Not only is it easy to use (just slide your iPhone into its two piece design,) it’s also a pretty solid case if you choose to use it as your everyday one. When you’re ready to access the battery you just flip a switch on the back and with the push of a button the four LED lights indicate how much power you have left in the Juice Pack Air. After use, just plug the USB cable in and recharge the unit quickly and easily. The best part for me though is that it’s not clunky like the battery packs of old, this is an aesthetically pleasing design in the hand and the pocket. The Juice Pack Air is available in red, white, and black. In addition to the iPhone 5, Mophie also produces cases for all other iOS devices AND the Galaxy SIII. Definitely well worth checking out if you use your smartphone a lot without easy access to an outlet. If my lifestyle/habits dictated it this would be a must have product. As it stands now, I am able to be plugged in all day and then unplugged at the course, etc with no battery issues. This is a sleek looking product (not clunky). Almost wish I needed one just so I could buy one. Another nice review here James! I’ve used a mophie or mophie like case for years. It’s great to get in 18 holes and still have your phone for the rest of the day. Great Job James. Being in Construction extra battery life is a huge benefit. Only draw back is with this device is is lose my otter box and that wouldn’t be an option. nice review james… i’ve been thinking about getting something like this for a while. i do like how sleek this one seems compared to a few other models i’ve seen. Extra battery life seems to be the hot topic when talking about smartphones these days. With the various uses we have for them, in my case, on the golf course, battery life is key. 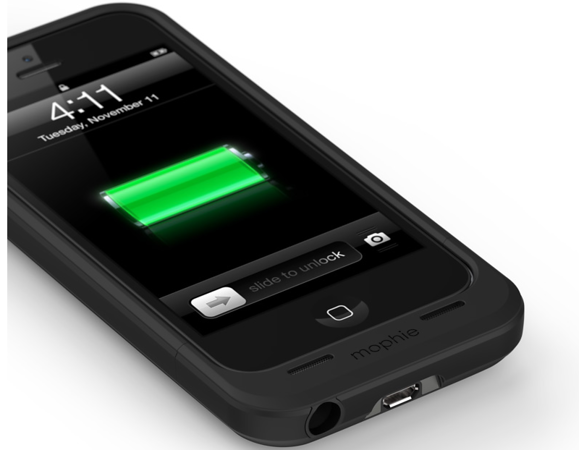 Mophie has always produced excellent products, and in my days of using iOS, the juicepack was a must have. Well done, James. Nice write up James. I’m struggling with the battery life on my iPhone 4 now, and with my upgrade coming in July this is certainly on the short-list of options. I have been looking at one of these for awhile now,…since I just got the Iphone 5. I just may have to pull the trigger. James, as I have come to expect, another excellent review. I have to think iPhone users are pretty limited without the ability to remove the battery, and it seems like this beats out the pain of carrying around a non-connected external battery. Great read there James…well done! IOS always gets the cool accessories first. I have been using one now for over a year since I use GolfShot GPS to keep my score and have been able to play 36 holes easily with it. It is a great case and has protected my iPhone 4S from many falls without any issues. I did have one fail on me after a year where it wouldn’t charge anymore because I had the battery on all the time and I would charge it every night which I think wore it out, now I only turn the battery on when the phone batter gets low. I got one of these all excited and I went threw 3 of them before just switching to the LifeProof (Water Proof) case. I was really disappointed because its an AMAZING idea!! But the battery would not charge with 3 different ones! Thanks for the review James. I’ve been noticing my iphone 5 battery just not lasting as long as before so I think this is going to be right up my alley. websites to read posts, but this website provides feature based posts.